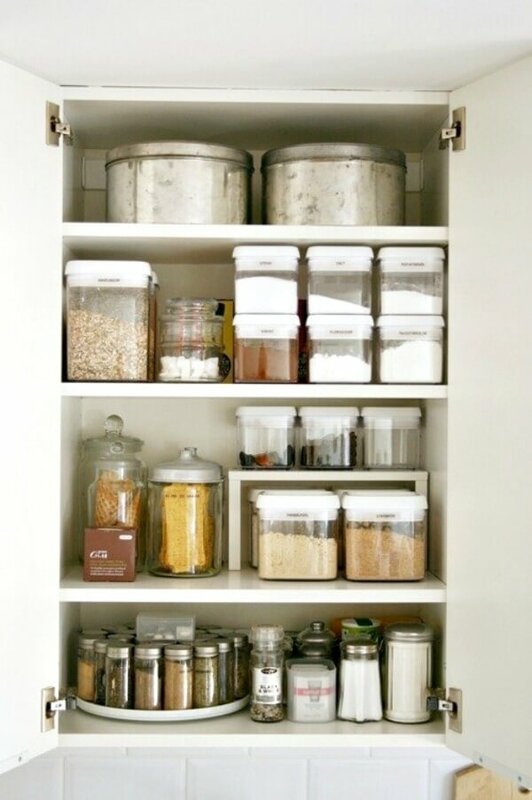 The kitchen probably needs to be the best organized room in the home for me. I’m always paring down to create more space. 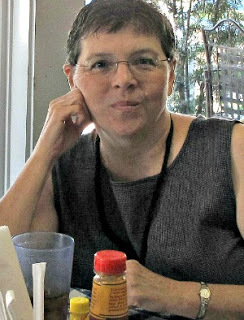 It seems that every time I pare down, I need to do it again in just a month or so. 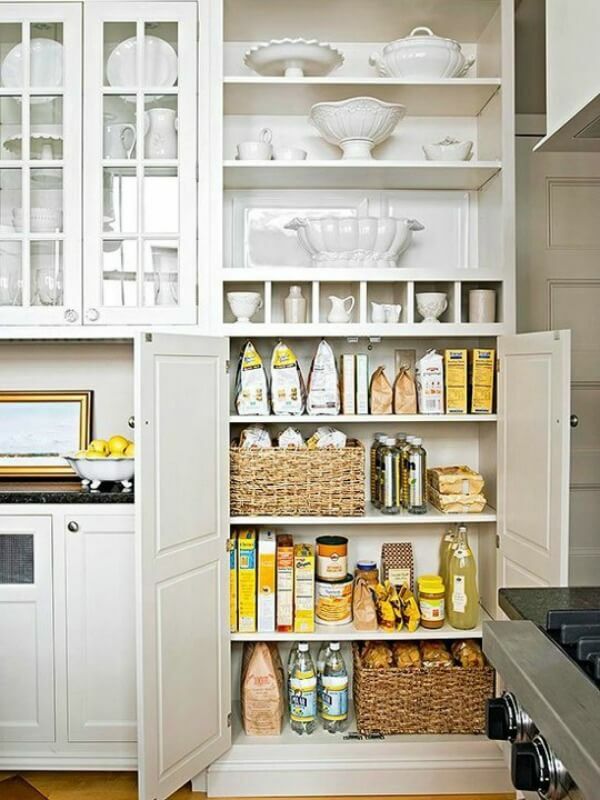 Here are some ideas to help you organize your kitchen. 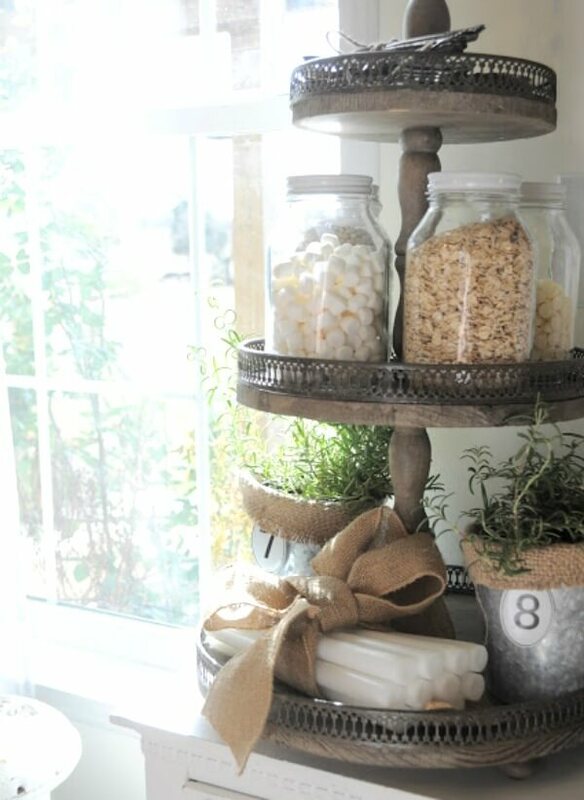 Above is a rustic way to organize by Buckets Of Burlap. If you live in a small space home, you always want to go vertical when you can to not take up as much horizontal space. Which is always at a premium. 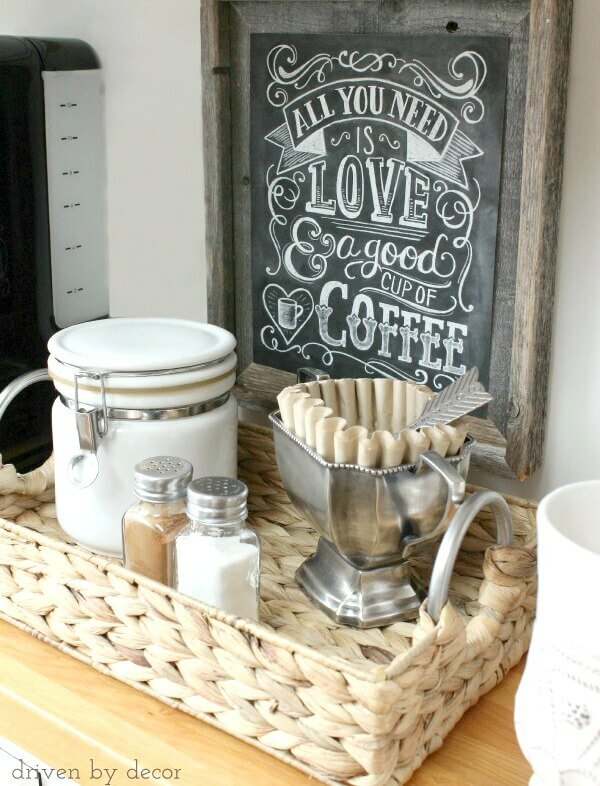 By using a tiered tray, you get the most out your space. And it is pretty on display. Everything looks better in a basket, don’t you think? All of these things would look cluttered without the basket to contain them. Above is a cute and creative way to store cupcake liners. And it’s pretty to look at as well. Win-win. This idea is just amazing. You could always find the spices and baking supplies you need with no difficulty with this set up. It reminds me of an old-fashioned store. It doesn’t get much prettier than this. I just LOVE these galvanized three-tier stands. And just like the one farther above, you’re staking out only a small bit of horizontal space. I guess you could say this is the ultimate in organization. Everything is in a container of some variety. You can see through them to get what you need. And some of the containers are stackable. Here’s another basket idea. It keeps the individual items from looking cluttered. I don’t have a dedicated pantry. But if I did I’d like it to look like this. By using one color, you are unifying the look and not distracting the eye. 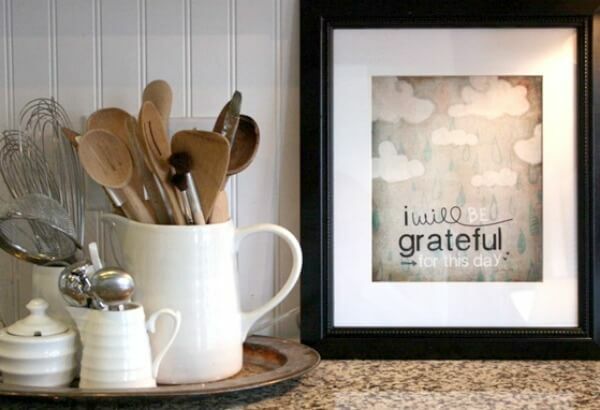 What is your favorite idea for organizing in the kitchen? 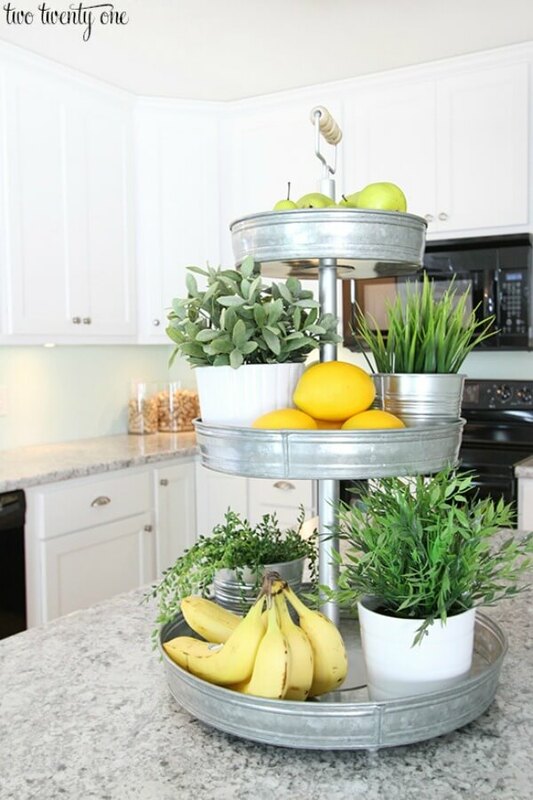 I would love to have one of the three tiered trays…….but don't know where I'd put it. Not much counter space.. I like the last one also and am "grateful for this day". Have a happy 4th of July weekend. 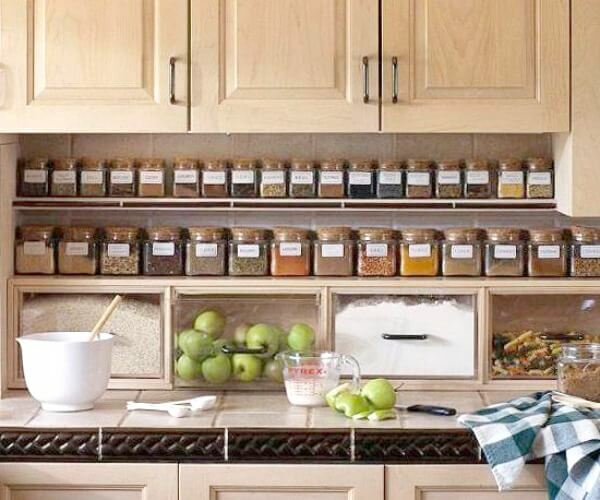 Oh Brenda, I'd love to have my spices looking organized and that photograph is one that I'd like to see in my kitchen! Great collections. I have a inspiration board of ideas too. I love the galvanized tiered thingys. I wonder if I can afford one. LOL. 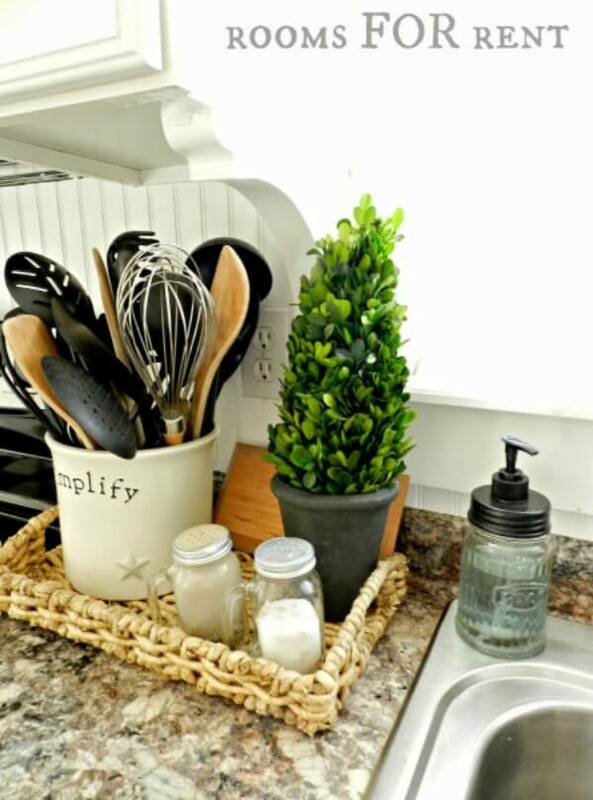 I hopefully will be moving my tiered dish holder off the counter to a new spot tomorrow. I'd love to replace it with herbs like in the photo! Thanks for sharing. 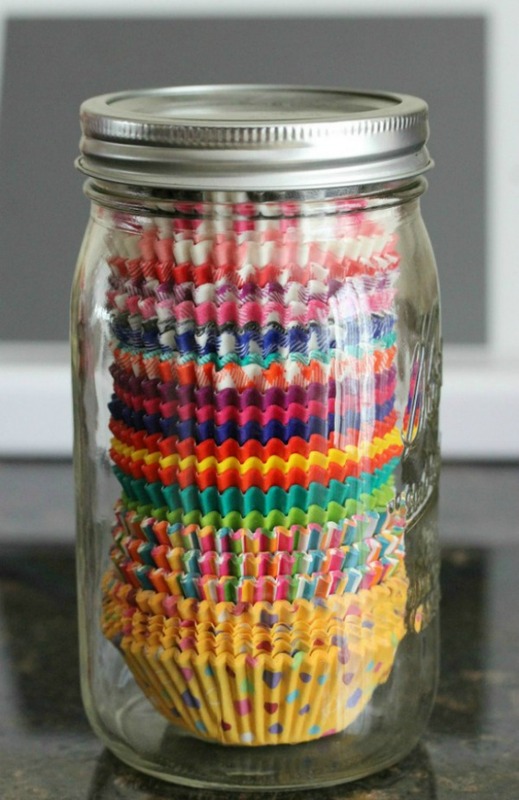 Mason jar for storing cupcake papers, that is how mine are stored. Yes..I really should strive to be a more organized person…she said..all of her life….lol.. This post inspired me. I'm going to store my cone (flat) coffee filters in my unused ceramic napkin holder at the coffee station.